Welcome » Overview » The 20th Century » 1901 to 1965 » Was It 1930? So when was TOS “City on the Edge of Forever”? It’s 1930, when the citizens of New York are wearing heavy overcoats, but there’s no snow or ice anywhere. Except that doesn’t quite work. This whole section has been drastically expanded and revised following a really amazing thread (my own contributions not counted, of course) at the TrekBBS, started by JonnyQuest037. Although there are explicit and really difficult to ignore references to the year 1930, there are also some background details that can provide clues about when the story takes place. As “Star Trek 365” (by Paula M. Block with Terry J. Erdmann, published by Abrams in 2010) points out, the problem with this song is that it wasn’t published until 1931. It features quite prominently in the storyline, becoming “Jim and Edith’s song.” It was a big hit, with Guy Lombardo’s recording becoming a number one in the US, but not until 1931. The song itself is copyrighted 1931. Indeed, it wasn’t until quite late in 1931 that the song really took off. I’m afraid I can’t find any references to it at all in the first four months of 1931, although there are plenty by November of that year. The fact is, no-one in 1930 was listening to “Goodnight Sweetheart”. It was The Best of Trek #5 (published by Signet in 1982; it’s on page 97, in an article called “Son of More Star Trek Mysteries—Solved!” by Leslie Thompson) where I first saw it pointed out that almost anyone would have responded “who?” when Edith says she’s going to a Clark Gable movie. The annoying fact is, that like “Goodnight Sweetheart”, the reference is at least a year too early. Clark Gable was certainly a working actor in 1930 (he was signed up as a contract player by MGM that year), but he wasn’t a star. Of course, “film star” and “star” aren’t always the same. Clark Gable made his Broadway debut in 1928, in a minor role, but rapidly moved up the billings. In 1930 he appeared at the Ettinge 42nd Street Theater in “Love, Honor and Betray” between Wednesday 12th March and Saturday 19th April. Edith could easily have known about him. Although he wasn’t really the star of any of the Broadway plays he appeared in, his part in the 1929 production “Hawk Island” as Gregory Sloane was the main role for a man in the play. In 1930 he played the chauffeur who convinces the heroine’s grown-up daughter to abandon her business career and run off with him. I suppose he only featured in the last act, but that last act would have needed a good performance from him to work. “Love, Honor and Betray” closed in April because the Depression was affecting audience numbers. Clark Gable travelled to California, where he starred in “The Last Mile” at the Majestic Theatre in Los Angeles. His performance led to a contract with MGM, initially playing gangsters and villains in supporting roles. Although he appeared in several silent pictures during the 1920s, and had a very minor part as an extra in the Norma Talmadge film “Du Barry, Woman of Passion” (the only “Clark Gable movie” released in 1930), his first major role in a movie was as treacherous cowboy Rance Brett in the low-budget Western “The Painted Desert”. Audiences in New York would have had to wait until March 1931 to see it. Unfortunately, I don’t have detailed cinema listings for New York in the early 1930s. My best guess is that the first opportunity Jim and Edith would have had to go to the Orpheum (if you’re paying attention, Edith names the movie theater) to see Clark Gable in a major role, would have been “Dance, Fools, Dance!”, where he played a gangster. It went on release in late February, 1931. As far as I can tell, it opened in New York at the Capitol on Friday 20th March, 1931 and ran for at least a week. The only “Orpheum” I’ve been able to find in 1930s New York is Loew’s Orpheum on 86th Street. I suppose it’s possible they went all the way there from their apartment building in the vicinity of the 21st Street Mission, but I’m not at all sure they would have bothered. Regardless of where they might have seen him, Clark Gable made a number of film appearances in 1931. In April, he appeared in a Richard Barthelmess picture “The Finger Points”, again as a gangster. In May, he appeared in “The Secret Six” supporting Wallace Beery (who’ll be back later). In June, he was in the supporting cast of “A Free Soul”, which starred Norma Shearer. Also in June, he remarried his second wife; they said it was necessary due to his divorce from his first wife, but it certainly generated publicity. By that stage, Clark Gable was already being seen as a new heart-throb. Audiences could make up their own mind, since he was back on the screen in July with “Laughing Sinners”; again he was one of the supporting cast, this time to star Joan Crawford. July was also the month MGM announced that their popular new male star would be taking the lead in a film called “Sporting Blood”. By August, “Laughing Sinners” has moved out of the Broadway movie theaters, and Clark Gable’s name has become decidedly more prominent in the film’s listings. “Sporting Blood” opened with Clark Gable as the main star in the middle of August, as did a Barbara Stanwyk picture called “Night Nurse” in which he also appears. The next new picture isn’t until October, when Clark Gable is Greta Garbo’s leading man in “Susan Lenox: Her Fall and Rise”. Anyone still wanting to see “A Free Soul” or “Sporting Blood” would have had plenty of chances, though. By November, Clark Gable is being described as “the screen’s latest sensation.” At the end of the month, his new picture “Possessed” with Joan Crawford opens in the Capitol on Broadway. Towards the end of December “Hell Divers” starring Wallace Beery and Clark Gable opens at the Astor on Broadway. Although Clark Gable, who has been cast as the heavy in William Boyd’s forthcoming picture, “The Painted Desert”, is only 29 years old, he estimates that in his brief career he has played in 250 stage plays. These include two plays a week for a year with the Ross Players in Wheeling, W. Va., a season in repertoire in Houston, Texas; two years with a traveling stock company in the Northwest during which 40 different plays were presented and several active seasons on Broadway. So, it’s not impossible. You do have to wonder why it comes as such a surprise to her that Jim and McCoy have no idea who he is. That is something unusual any time before the middle of 1931. This is something I had drawn to my attention by the Star Trek History website. 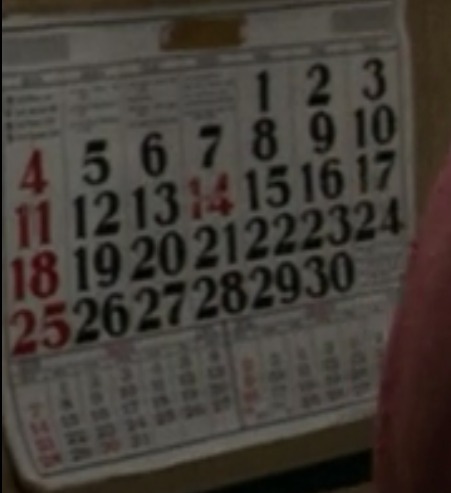 Hanging on the wall of Edith’s soup kitchen is a big calendar. Thanks to high definition, it’s possible to see that in addition to being a 30 day month, the first day of each week is highlighted in red, along with the 14th. Since the first weekday is highlighted, I think it’s very likely that the calendar begins each week on a Sunday, making the first a Thursday. It’s not a 1930 or a 1931 calendar. It looks very much as though the year and month information has been deliberately obscured. I don’t doubt that the background really is a genuine 1930s vintage calendar, but some marvellous sleuthing on the TrekBBS means that the calendar itself shows the month of June 1967, reflecting the year TOS “City on the Edge of Forever” was made. As a background detail, it’s marvellous. As a dating clue, it is near-worthless. Please note that the image I’ve used is the copyrighted property of CBS, and used here without permission, for strictly non-commercial purposes. The image itself was captured by Maurice and posted at the TrekBBS. EDITH: Centuries from now? Who is he? Where does he come from—er, where will he come from? KIRK: Silly question. Want to hear a silly answer? KIRK: A planet circling that far left star in Orion’s belt. See? It might. I’ve been using the Starry Night astronomy software to get this information, so I think it’s accurate. Of course, that doesn’t necessarily mean it is. The star in question goes by the proper name of Alnitak. It’s not the most plausible star to have an inhabited planet orbiting it, but that can often be said of the “real” named stars in “Star Trek”. Like the rest of the constellation of Orion, Alnitak is easily visible from New York, assuming the skies are clear enough (a bit of a big assumption, but Jim and Edith obviously can see it). It stays in the southern half of the sky, rising over the horizon in the east, travelling to its highest position in the sky roughly six hours later. By then, it’s almost directly due south, and about halfway between the horizon and directly overhead. Starry Night says the altitude is around 47 degrees, so that’s as high as Jim Kirk will ever need to point. The star then slowly sets, falling behind the horizon after about twelve hours over towards the west. If we arbitrarily assume that Jim and Edith are looking at the star when it’s highest in the sky, and it’s about nine in the evening (neither being absolutely established by what we see) what’s the date in 1930? The answer is unequivocal: it’ll be around Thursday 13th February, 1930. That’s a bit of a problem, because the temperature on that day varied between a maximum of 49 and a minimum of 34 degrees Fahrenheit. It’s above freezing, but not by much. Over the previous few days, the temperature was even lower. The temperature information for each day is available here: https://www.ncdc.noaa.gov/cdo-web/datasets/GHCND/stations/GHCND:USW00094728/detail. At this link https://www.climatestations.com/new-york-city-2/, you can get a set of graphs to show the weather. KIRK: Excuse us, miss. We didn't mean to trespass. It's cold outside. EDITH: A lie is a poor way to say hello. It isn't that cold. My guess is that the weather has to be cold enough for Kirk’s excuse to seem plausible enough for him to try it, but not that cold. As the graph above shows, January and February are the coldest months, so it is difficult to see why Edith is so unwilling to accept his explanation, even if that particular day happens to be unusually mild. Are there any reasonable alternatives? When is there the slightest chance that Jim and Edith will be able to see Alnitak in the night sky? Starting later in the year (because early November 1930 is the time when the weather is still “not that cold” and there’s a film out with Clark Gable in it), on the 1st of October, Alnitak doesn’t rise at all much before midnight, is at its highest at about six in the morning and sets around midday. It doesn’t sound all that practical. On 1st November, it rises at around ten at night, is at its highest about four in the morning, and sets at around ten in the morning. I have to say, that was a disappointment to me. Moving back a little, on the 1st May, Alnitak will rise at about ten in the morning, is at its highest around four in the afternoon, and won’t be visible at all after ten at night. Again, it might be possible, but it doesn’t strike me as the most likely option. The least unlikely time for Jim and Edith to be stargazing seems to be sometime around the middle of March. It’s dark, but Jim’s walking Edith home from the Mission. Undoubtedly, the Mission closes quite late, and they have to clean up afterwards, but they also have to be back early the next morning to do it all again. It’s not likely to be much later than around nine, and it certainly won’t be the early hours of the morning. At 8.30 in the evening, Starry Night says it’ll be dark. Alnitak will still be about forty degrees above the horizon, and more importantly, it’ll be off to the south-west, hanging in the sky directly in front of anyone looking down one of New York’s avenues. The smart-aleck answer to that one is “1967.” In the end, it’s always going to be the case that the needs of the story will overrule strict historical accuracy. I cannot possibly know why the production team on “Star Trek” didn’t shift the date forward at least a year to 1931 or 1932, or use background details appropriate to 1930. They just didn’t. I doubt they ever really thought about it that much, to be honest. I have to pick a date. Not because I think it’s up to me to decide, but after poking about in the Internet Archive scanned texts for information about films and film stars in 1930 and 1931, and learning more than I ever needed to know about “Goodnight Sweetheart”, I can’t just throw up my hands and walk away from it. Strangely, all the background evidence points to one possibility. Early in 1932, all of the requirements for the story will be met. Clark Gable is a big movie star that everyone knows about. “Goodnight Sweetheart” is probably “last year’s hit” but there’s no reason it couldn’t be playing over the radio when Jim and Edith walk past. Alnitak will (if you’re very lucky) be visible in the evening sky. Where does that leave us? There’s no way you can wave away the absolutely clear references to the year 1930; but equally, you can’t ignore the impossibility of the background details applying to that year. My timeline deliberately tries to explore alternative options, and I’ve jumped through hoops trying to keep “Star Trek”’s version of history aligned as closely as possible with real-life events. If the evidence had been contradictory, I’d have insisted on 1930. Since it all points to one time, I’m going to please absolutely no one but myself and say that TOS “City on the Edge of Forever” happens in early 1932. It is by no means the only time everyone on the show has been absolutely clear about dates or times, and been just as absolutely demonstrably wrong. What about the nonsensical “900 years” reference in TOS “The Squire of Gothos”? Of course, once I’d decided that Data is wrong about it being 2364 in TNG “The Neutral Zone”, anything is possible for me. In the end, the weight you attach to any given statement is a matter of personal preference. The really big advantage to moving the story to 1932 is that I can provide background detail. After all, if Clark Gable has a different career in “Star Trek”’s 1930, was the weather the same? What would be identical to our own version of history? So, when would I place the story? Let’s look at 1932. First, the weather; as I noted above, quite detailed information about temperature and rainfall can be obtained. When would be suitable in 1932? Looking at the first two graphs, it’s obvious that January is a much warmer month than average, as is the first half of February. In fact, the temperature in January 1932 only dropped below freezing at all on three days. There was less than five inches of rain in the whole month, and no more than a few snow flurries. There was no snow lying on the ground at all, since it was so warm. The start of February was quite warm, after a cold snap at the very end of January. March started off colder than usual, and then became pretty average. In both February and March, the night time temperature regularly dropped well below freezing. So, Edith Keeler would be well-justified in telling Jim Kirk that “it isn't that cold” when he gives the excuse. The fact that it’s January would still make it cold enough for Jim to think of it in the first place. January also has the advantage that it gets dark early. By the time you’re getting into late March, the sky in New York is still light until around eight o’clock. Remember, Jim is walking Edith back from work. It’s her work, so that’s the 21st Street Mission. It’s possible he’s taken her out for a meal, but I’m guessing that he and Spock eat mainly at the mission (the hard roll with bologna and assorted vegetables are for them to eat during the day), where they help out Edith most nights. At a guess, the Mission opens early and closes late, but not that late. Normally, Edith is in there alone, so she’s not going to be hanging around once she’s finished serving meals and giving inspirational speeches. All this is to say that I think it’s January, because I doubt it’s much after 8:30 in the evening when Jim points out Alnitak in the night sky. Even if you imagine they’ve wandered around for hours in the first flush of love, I think it’s becoming an elaborate and unlikely explanation. They’re just walking home. All you can say for certain is that it’s dark, and there is a particular star in the sky. Early in the year fits those conditions best. When in January is it? More to the point, how long are Kirk and Spock in New York at all? Spock’s best guess is that they arrive a week before McCoy. My own guess is that everything we see will fit into nine days from start to finish. Other guesses extend to as much as several months, but I’ll stick with just over a week. It certainly keeps things simpler. There’s not really any more information available, except that Jim’s taking Edith to the movies on the last day. It could be any day of the week, but I’d guess that all-important “first date” is more likely to be on a Friday or Saturday. I originally assumed that Saturday was the best bet, but if they go to the movies on a Friday, then the skies are nice and clear when Jim and Edith are looking at the stars. Once you need the weather to be unusually warm, dry and sunny to match what we see, then it becomes obvious that the Friday Jim and Edith are planning to see a Clark Gable movie is Friday 22nd January. Kirk and Spock will arrive on the 14th, right in the warmest part of the month, with temperatures you wouldn’t usually expect until well into April. Assuming Kirk walks Edith home and the look at the stars on the sixth day, it’ll be Tuesday 19th January. On that day (according to the “Starry Night” astronomy software), Alnitak will rise above the horizon at 16:39 local time, will be at its highest above the horizon at 22:34, and will set below the horizon at 04:30 on Wednesday 20th. Better still, there aren’t likely to be many clouds in the sky that night. The streets of New York are laid out in a grid pattern, but it’s one based on the alignment of Manhattan Island, not the compass. In general, the Avenues run north-south, and the Streets run east-west. In practice, anyone looking south along the street in New York is going to be looking either south-west or south-east, rather than directly south. If they aren’t looking south at all, then they definitely won’t see Alnitak. We can discount the time when looking south-west will be in the direction of Alnitak. That’ll be after midnight. At 8:00 in the evening, Alnitak will be in the south-east to any observer in New York, about 35 degrees above the horizon. It’s dark, because the Sun set at around 6:00, a good two hours earlier. From this, I’d guess that Jim and Edith are strolling along either 21st Street or a parallel street at about eight at night. The sky’s clear enough for at least the brighter stars of Orion to be visible right in front of them. Jim’s looking up, thinking about the stars, so Edith’s casual comment “let me help” instantly puts him in mind of the future inhabitant of Alnitak. Story: Kirk and Spock arrive. They steal some clothes, and hide in the basement of the 21st Street Mission when they’re chased. Spock estimates they have about a week to wait before McCoy arrives. They meet Edith Keeler, who offers them work, and somewhere to sleep. Weather: Maximum temperature: 70°F (21°C); Minimum temperature: 55°F (13°C). Rainfall: Trace amounts, no snow. It’s partly cloudy, but fair. In the News: Today is the warmest on record in New York, at 68°F. (I’m guessing the “official” temperature isn’t the one measured at the Central Park weather station.) An airship flew over New York making a charity appeal for old clothes for the unemployed; an amplified announcement was made that could be heard over about a mile. On 12th January, Mrs Hattie W. Caraway was elected as the first woman Senator in the United States. Story: Kirk and Spock report for work at the Mission at seven in the morning, I assume. Weather: Maximum temperature: 67°F (19°C); Minimum temperature: 48°F (9°C). Rainfall: Trace amounts, no snow. It’s partly cloudy, with rain forecast, along with colder weather. In the News: The “Mellon Plan” is announced to increase income tax and reduce the shortfall in government revenue. A new Cabinet was announced in France, under the leadership of Pierre Laval. President Hoover was announced as a candidate for re-nomination for the Presidency. The city of Chicago was in danger of suffering a financial collapse. Gandhi’s wife was sentenced to six weeks in prison for promoting peaceful resistance to British rule in India. There was considerable interest in the decision to place four American citizens on trial in Honolulu for the murder of local inhabitant Kahahawai. The US Navy was extremely critical of the administration of law and order in the territory. Weather: Maximum temperature: 48°F (9°C); Minimum temperature: 40°F (4°C). Rainfall: Trace amounts, and trace amounts of snow. It’s cloudy, and quite a lot colder. Story: Spock has spent 90% of their combined wages for the previous three days building his contraption. The figures mentioned imply they earn about $3 a day between them. Since the “flop” cost $2, it must be at least the fourth day. Edith can get them work washing dishes that evening. Weather: Maximum temperature: 52°F (11°C); Minimum temperature: 38°F (3°C). Rainfall: 0.02 inches, and no snow. In the News: On Saturday, five armed men forced their way into the Manhattan apartment of Robert Le Roy and made off with jewellery worth $10,325 after tying up the elevator operator and three maids. The Soviet government made public the details of a railway disaster that had occurred on 2nd January, in which 65 people died at the scene, and 130 were injured. The accident happened at Kosino, about ten miles from Moscow, and 11 railwaymen were charged with gross violation of the regulations. The treasurer of the Indian National Congress was arrested in Bombay. Story: Spock steals some tools from the Mission, and Edith spots it. Weather: Maximum temperature: 56°F (13°C); Minimum temperature: 40°F (4°C). Rainfall: Trace amounts, and no snow. The clouds are clearing away. In the News: Attempts to secure a loan for the continued finance of New York City remained unsuccessful after negotiations at the weekend. The sticking point is subway fares, which were fixed at a maximum of five cents. Story: Jim walks Edith home from the Mission. They look at the stars together. Weather: Maximum temperature: 40°F (4°C); Minimum temperature: 34°F (1°C). Rainfall: No rain, and no snow. Clear and cold weather. In the News: Gandhi’s youngest son was also imprisoned for six months in India. It’s the 126th anniversary of the birth of Robert E. Lee. A New French cabinet was appointed. It was announced that a pre-Aztec tomb had been found at Monte Alban in Mexico, filled with gold and jewels. Charles Dawes was appointed president of the Reconstruction Finance Corporation. The statue of Eros was returned to Piccadilly Circus, after requiring repairs costing £162, due to damage sustained during New Year’s celebrations. Weather: Maximum temperature: 52°F (11°C); Minimum temperature: 35°F (2°C). Rainfall: No rain, and no snow. The weather is cloudy again, but warmer. In the News: A competitor was killed in the Monte Carlo Rally when two of the cars collided. The New York State Legislature allowed New York to start issuing corporate stock notes so the city could stay solvent. Story: Very early in the morning, McCoy arrives. He is inadvertently responsible for the death of a vagrant. He wanders around the streets for several hours before going into the 21st Street Mission and collapsing. Edith lets him lie down in an upstairs room, where he spends the rest of that day and most of the next unconscious. Weather: Maximum temperature: 43°F (6°C); Minimum temperature: 40°F (4°C). Rainfall: 0.19 inches, and no snow. It’s cloudy, but warmer. In the News: Robbers steal $250,000 (later revised to $310,000) worth of jewellery from Mr and Mrs Harry Glemby, using “the package delivery ruse” to get into their apartment just off Fifth Avenue. A report in The Times (London) suggests that the “package delivery ruse” actually consisted of three men with large burlap sacks claiming to be delivering illicit alcohol to the apartment. The robbery seems similar to the one suffered by Robert Le Roy. The State Council of Ceylon votes to introduce income tax to the colony, over the strong objections of the European residents. Story: Jim is taking Edith to the movies. McCoy has recovered from his cordrazine poisoning, and hears their voices in the street. Spock has probably stayed at the Mission to clean up when Jim and Edith went off to get ready to go out. Kirk, McCoy and Spock meet just outside the Mission, and Edith gets squished by a truck. The Guardian of Forever decides time’s as close to its proper shape as can be expected, and takes the time-travellers back. Weather: Maximum temperature: 54°F (12°C); Minimum temperature: 40°F (4°C). Rainfall: Trace amounts, and no snow. It’s cloudy, and getting colder. In the News: The Irish Free State celebrated its tenth anniversary. Clark Gable: What movie were Jim and Edith planning to see? The “big Clark Gable movie” at the time was “Hell Divers” at the Astor on Broadway, but the tickets were $2. My guess is that they were staying closer to home, and that they’d be seeing one of Clark Gable’s other pictures, for quite a bit less. I think that they’d be walking to the Orpheum that night to catch “Possessed”, a “rags to riches” story starring Joan Crawford opposite Mr Gable.